The Affordability Map was inspired in part by the article “Housing and Transport Expenditure: Socio-spatial Indicators of Affordability in Auckland” by K. Mattingly and J. Morrissey MaMo2014 and is updated every calendar quarter. The story is this. You and your partner, if you have one, just got a job in Auckland (or Wellington or Canterbury). Now where to live? The map color codes the region’s rental areas by their affordability to you. 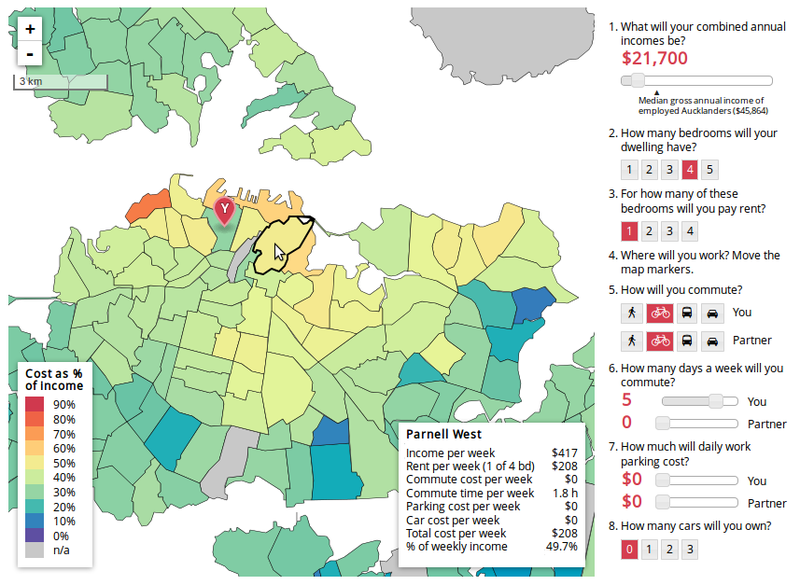 Here affordability is based on median market rents, your commute costs, and your answers to various questions. After choosing your parameters, you can then hover over any area to bring up a detailed cost breakdown for that area. Using the map, you can explore different scenarios and quickly appreciate the multifactorial nature of affordability, that it is not simply about rent to income ratio. Try it out! The project is open source: its data and source code are permissively licensed and can be found on Github, and contributors are welcome. For more on the data and methodology we used, see the map’s about page. Since its creation in 2014, the Affordability Map has been featured in the New Zealand Herald twice, appeared as a case study in open data on data.govt.nz, and has been used by tens of thousands of people across New Zealand. I’m proud of MRCagney’s production of this educational project and heartened by the positive feedback I’ve received from its users.